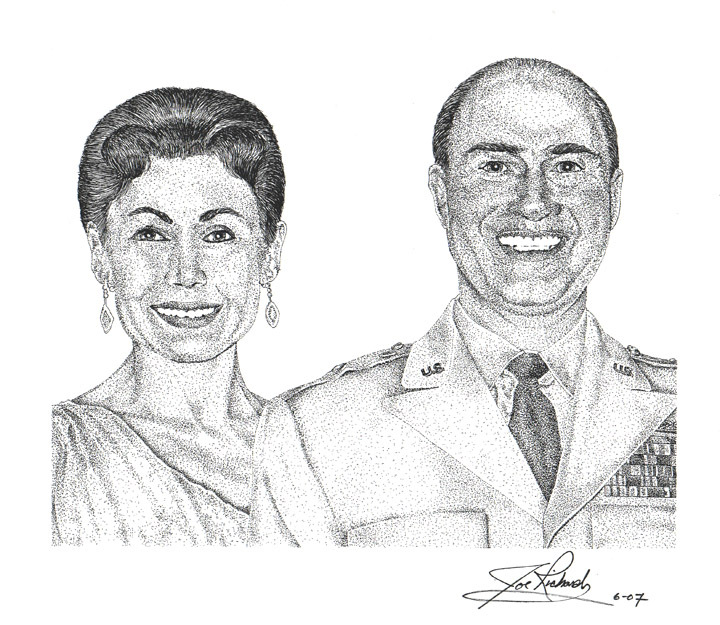 "General Dearing and His Wife"
"General Dearing and His Wife" is a that was derived using a photo taken about 1959 of the General and his wife while they were attending a military function in Turkey. The image used was orginally about 5 x 7 inches in size. This study in pen and ink techniques was completed in June 2007. Extensive use of stippling effects combined with some line art was used to create a dramatic finished design as "General Dearing and His Wife". This work took 13 hours to complete and measures 8 1/2 x 11 inches on a 11 x 14 inch bristol board background. ©2007 Joseph L. Richard. All rights reserved.